Environmental consultant John W. McTigue examines a rock he says is covered with blue-green algae, not oil. PLYMOUTH, Mass.– When proceedings in the Bouchard oil spill trial resumed Monday, defense lawyers called two experts who challenged earlier testimony from plaintiffs’ witnesses regarding oil contamination at Mattapoisett beaches and its impact on the rental value of coastal properties. Bouchard’s environmental consultant John W. McTigue used a memorandum from the state Department of Environmental Protection to explain why subsurface oil that remains at Leisure Shores beach poses “no significant risk to public welfare,” meaning it does not create a nuisance condition or a loss of property value as defined by state cleanup laws. About 1,100 Mattapoisett property owners are seeking damages from Bouchard for the loss of enjoyment and use of their beaches due to contamination from the April 27, 2003 oil spill. Last week during the civil trial, the plaintiffs’ environmental consultant Richard J. Hughto testified that he believes Leisure Shores and a beach at 15 Seamarsh Way pose a significant risk to public welfare due to oil that appeared when he dug test holes in the sand. He said the oil at 15 Seamarsh Way stuck to his fingers and had a strong odor. McTigue told jurors that state cleanup laws “allow for some level of residual oil, acknowledging that it is not always feasible” to clean up all the oil from a spill. Environmental consultant John W. McTigue examines a clump of seaweed. He also testified that some people have mistaken asphalt, seaweed and algae for remnants of No. 6 fuel oil, which spilled into Buzzards Bay when the Bouchard B. No. 120 barge drifted off course and struck an underwater ledge. “Oil can be confused with other things that look like B. 120 oil but are not,” he said. 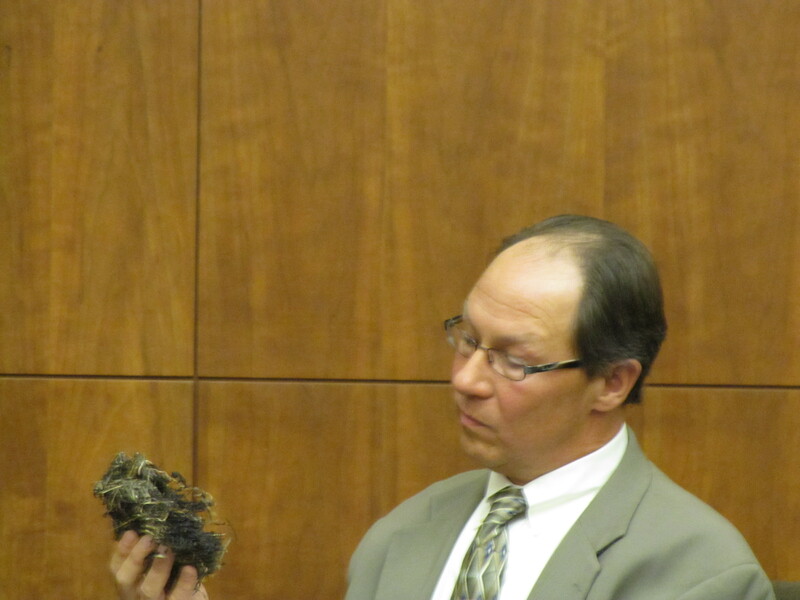 During questioning, defense lawyer Ronald W. Zdrojeski lifted some objects out of a cardboard box and handed them individually to McTigue: two large rocks, a tub of seaweed and some chunks of asphalt. 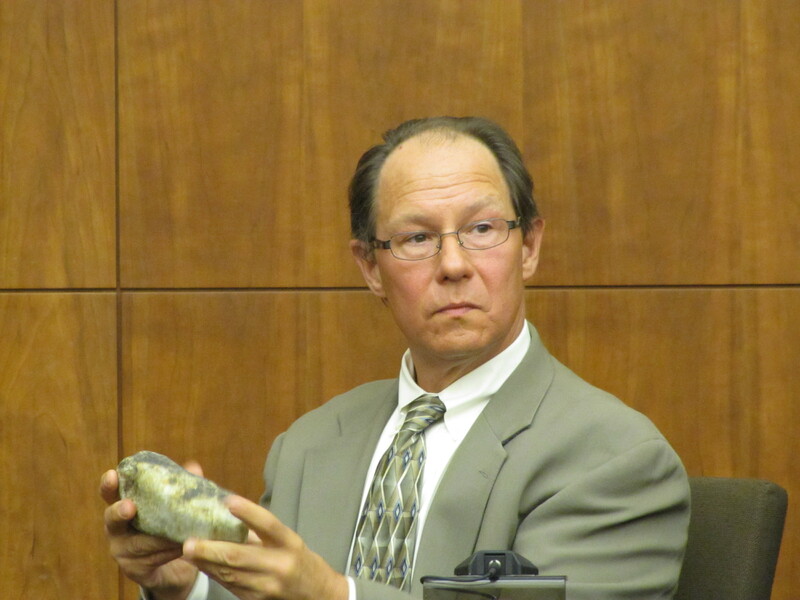 He asked McTigue to identify each object. 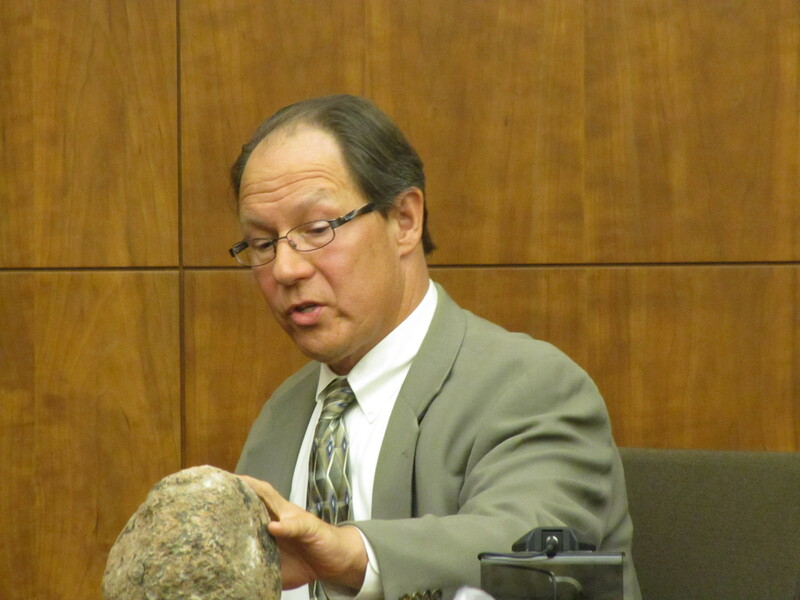 Environmental consultant John W. McTigue testifies that a rock is covered with dry, hardened oil. “When it’s wet, it is blacker and could be mistaken for oil,” he said. Zdrojeski then asked Judge Raymond J. Brassard if the court officer could pass the evidence around the jury. Brassard agreed despite protests from plaintiffs’ attorney Martin E. Levin. Environmental consultant John W. McTigue examines chunks of asphalt. During cross examination, Levin asked McTigue if he knew when and where the objects were collected. McTigue said he did not know. 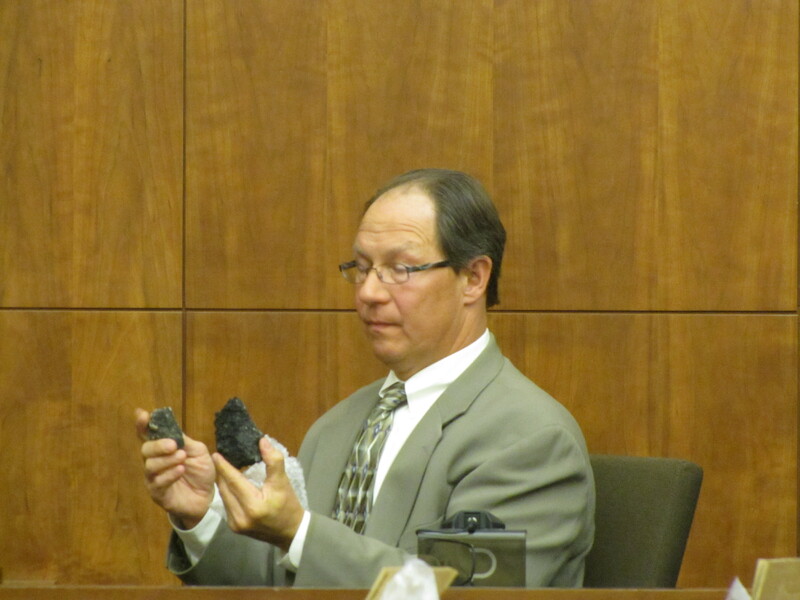 Levin then asked the witness if he knew if any of the plaintiffs’ had ever seen the rocks, the seaweed or the asphalt. McTigue said he did not know. 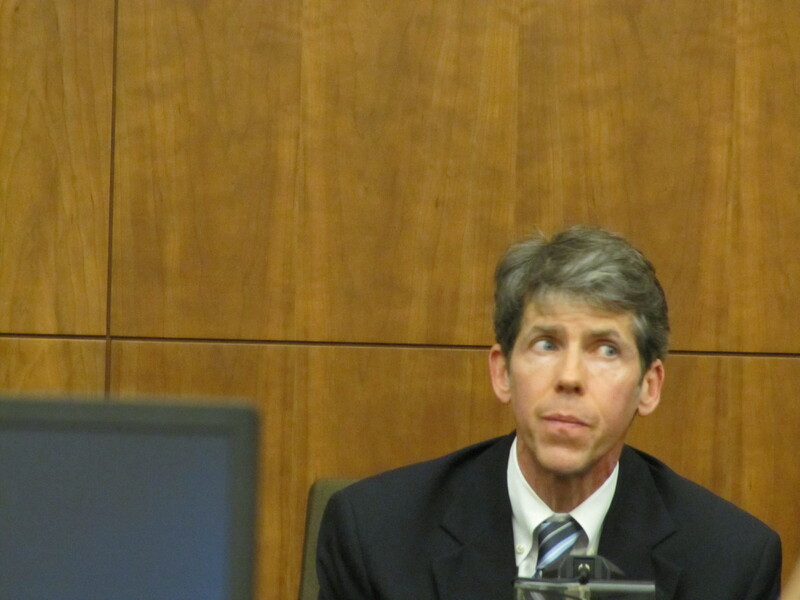 The defense called real estate appraiser Michael J. Hart as its second witness of the day. Hart said he was hired by Bouchard to analyze a study conducted by the plaintiffs’ real estate appraiser Jonathan H. Avery, who testified last week that property owners had lost between $5,000 and $60,000 in rental value due to the oil spill. Real estate appraiser Michael J. Hart testifies about Mattapoisett coastal properties. The defense is expected to call its final witnesses on Tuesday, when the trial continues at Plymouth County Superior Court. Follow the proceedings live with ThreeBeats on Twitter. It’s easy, just visit http://twitter.com/threebeats and read the postings. No need to be signed up for Twitter. You can also read the tweets here on ThreeBeats in the box at the right, top of the page.